Retail $15.00 SAVE 20% ! This was one of my first models I have ever built and it was fun and simple to build. The model is and easy build and everything fits well together. The only problem I had with this tank was assembling the tank&apos;s tracks which took me a while to do. Other than the tracks, the model was a great build. I would recommend this model to anyone who is interested in building a tank whether you are new to modeling or not. "A decent model for a beginner on a budget. Other than that...."
Feels too much like a toy trying to become a model. I would rate it a good model project for a beginner. It doesn&apos;t get 4 or 5 stars in my book because of a couple of issues that have existed since the first time I built it over 40 years ago. The first is the front sprockets. Because of the way the sprockets mount with the poly-caps, the tracks have a tendency to pull the sprockets inward and they can end up crooked. I also had to do a fair amount of plastic removal to make the sprocket mounts fit squarely to the hull. Same thing happens with the back wheels. I also don&apos;t like the way the spare track connects to the front. It isn&apos;t very solid. I would recommend this only for a beginner on a budget. This kit is a excellent for beginners! All the parts went together just fine. Low part count but had awesome details with the tools and such. Great for a beginner painter to paint weather and such. For the price of this kit and what it comes with is unbeatable! I really enjoyed this kit when i was painting it and building it!! I will definitely buy more and make a awesome diorama with them and give to if anyone I know is thinking about starting this hobby! 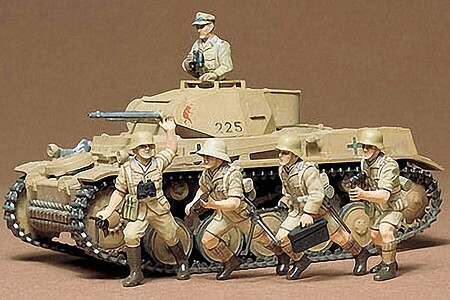 This kit is fun to build, I have made two, this one in Panzer grey and another in Afrika Korps coloring. Parts fit is fine, little flash, comes with five Afrika Korps figures. Easy quick build that can be weathered and customized easily. I recommend this one for any modeler. Spend a day and have fun. Unsuitable for kids under 3 years old. Use modeling tools with caution. Recommended paint for this item are for us by adult modelers only.